cityborg is a cultural project oriented to build a digital open platform to generate social networks in our mediated environments. 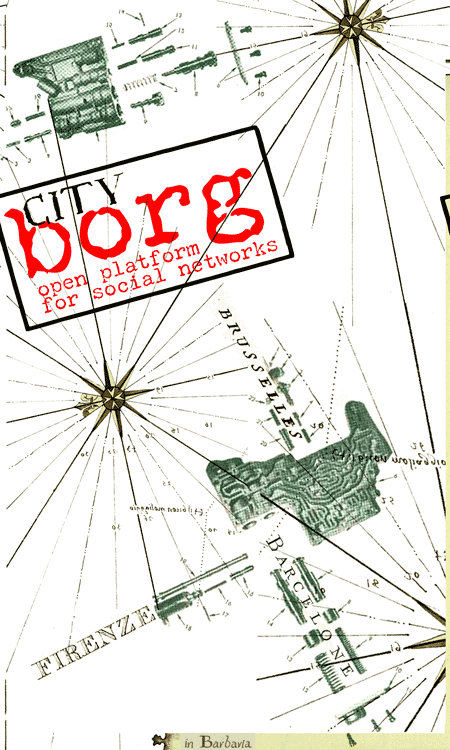 our open basis are the cityborg distro, a gnu/linux distribution, and the related internet node, cityborg.net. we incorporate context weblog — information on arts, science, technology, and their intersections — to track the emerging culture and transform the news on cutting edge technologies in new features for cityborg distro. the roots of cityborg are nurtured by the energy and growing dynamics of 'collective of collectives' in barcelona' underground. in this 'primordial soup' we feel the need for a new cultural tool that synthesyze and contribute to the new cultural movement (free software, urban explorers, diyers, hackivists...). the borg live cd is a bootable cd-rom containing a gnu/linux operative system , that permits you to boot directly from the cd , without the need of an hard disk installation. the system is based on slax, the slackware linux live cd. features: kernel 2.4.27, the xorg graphical system, windowmaker , icewm , windowlabs as desktop managers and many programs , including... firefox ( browser ) , thunderbird ( e-mail client ) , gaim ( instant messenger ) , gnomemeeting ( video conference and telephony ), mplayer ( audio/video encoder/decoder ), xine ( video player ) , cinelerra and kino ( video editing ), pure data - pdp - pidip (real-time computer music software ), and jack (a low-latency audio server). >from *cityborg site*.